Happy Sunday everyone. I hope you guys all have a fun and or relaxing day planned, and that it is full of sunshine! I wanted to share these quesadillas I made for the kind people over at the Inspired Homes site. 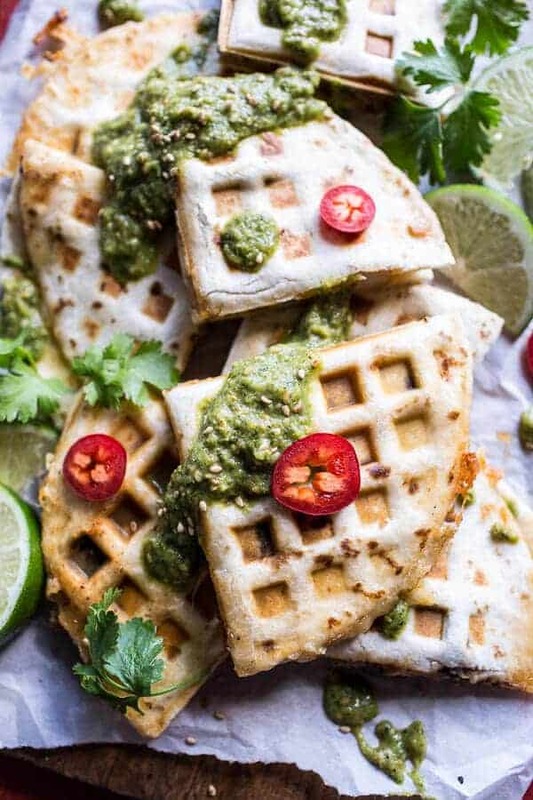 They are waffled dillas full of spicy, grilled pork al pastor, cheese, rice and a tomatillo salsa verde that could pretty much just be eaten with a spoon…I mean, having it in a cheesy quesadilla, is obviously better, but the point is that it’s spoon worthy! It’s a little Mexican Korean fusion food, and it is so good!! Oh, and to make things even more fun, I used a waffle maker to cook my quesadillas. That may seem odd, but it works so well. Plus, I feel like everything cooked in a waffle maker just tastes better…or maybe that’s just because they are more fun to make this way. Anyway, the waffle maker cooks a delicious quesadilla! Spicy Pork Al Pastor Quesadilla with Roasted Tomatillo Salsa Verde. 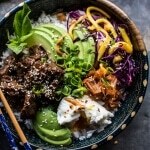 It’s a little Mexican Korean fusion food, and it is so good!! In a blender or food processor, combine the onion, garlic, chili powder, oregano, cumin, chipotle chilies + adobo sauce (from the can of chipotle chilies), orange juice and pineapple. Blend until smooth. Add the pork to a large bowl or gallon size Ziploc bag and then pour the sauce over the pork. Toss well to coat. Try and make sure that almost all the pork is submerged in the sauce. Cover and place in the fridge for 1 hour or overnight. Meanwhile, prepare the tomatillo salsa. Preheat the broiler to high. Line a baking sheet with parchment. Add the peeled tomatillos and place under the broiler for 3-5 minutes, turning once or twice or until the tomatillos are mostly charred all over. Remove from the oven and let cool slightly. Then add the charred tomatillos and pineapple chunks to a blender or food processor. To the blender, add the Korean Sunchang, sesame oil, rice vinegar, soy sauce and lime juice. Blend until mostly smooth. Pour into a glass jar or serving bowl and then stir in the sesame seeds. Cover and store in the fridge until ready to serve. The sauce can be stored for at least a week in the fridge. Preheat the grill or a grill pan to medium high heat. 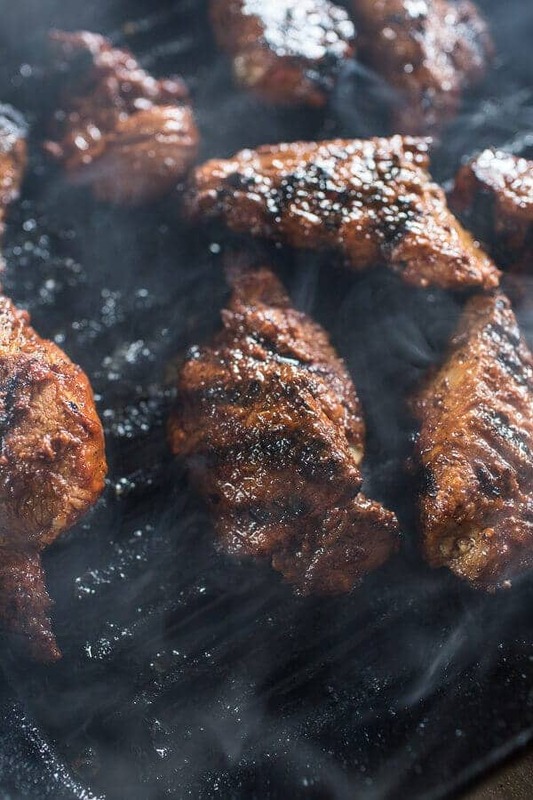 Once hot, remove the pork from the marinade and grill until cooked through, about 4-5 minutes per side (depending on how thick or thin your cut of pork is). As the pork is cooking, spoon the marinade over top for extra flavor. Allow the pork to rest at least 10 minutes and then dice into bite size pieces. While the pork is resting, you can add the remaining marinade to a small saucepan and bring to a boil, reduce the heat and simmer 5 minutes or until slightly thickened if desired. Preheat a waffle iron or quesadilla maker. Once preheated, layer one tortilla on the waffle maker and then add a layer of cheese, a layer of pork, a sprinkle of rice and then another layer of cheese. Add the top tortilla and carefully close your waffle iron. 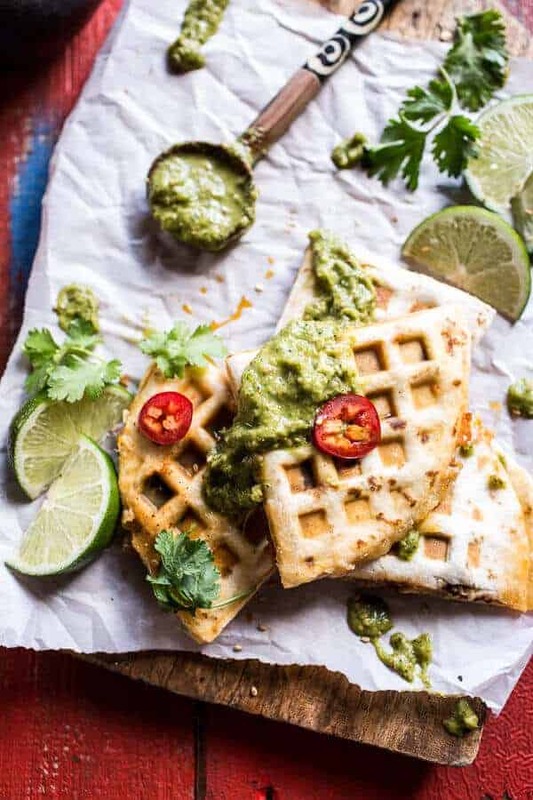 Be careful not to overload your quesadilla or your waffle iron will not shut. Cook until lightly golden and browned, about 5 minutes. Repeat with the remaining ingredients. Serve the quesadillas warms with the salsa verde and fresh cilantro. *Korean Sunchang is a Korean chili paste/sauce and can be purchased on Amazon. You may also use sriracha or Gochujang (Korean chile paste) in its place, but I really love the flavor the Korean Sunchang adds. Have a great Sunday and find the recipe for the Spicy Pork Al Pastor Quesadillas here! 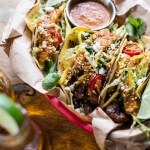 Bulgogi BBQ Pork Tacos with Charred Tomatillo Sesame Sauce + Spring Onion Slaw + VIDEO. Oh my gosh, I have no words for that blogiversary cake! A waffled quesadilla? I feel like we need a word dedicated to this. But I can’t think of one right now. This looks so yummy, anyways. Quesadillas were a childhood favorite! These look even better! They say the more time we spend preparing our food and the presentation of it (actually sitting down at a table with no interruptions) the healthier eaters will become. So sitting down to eat what is pictured above would be an AW moment. THANK YOU!! Hope you had a great weekend, Nancy! Korean/Mexican things always sound so tasty! There’s a local food truck that sells kimchi quesadillas with a spicy aioli, and it’s so rich and so good. Tieghan, you are speaking my language with Mexican+Korean fusion (there’s never enough cheese in Korean food, making fusion an excellent solution). Sunchang is hands down my favorite. 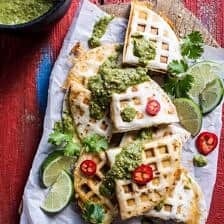 Between your waffled quesadillas and Mandy’s mochi waffles I’m about ready to throw in the towel and get a waffle maker! Thanks for the shout-out and the positive vibes, too! Of course and seriously, congrats on three awesome years!! 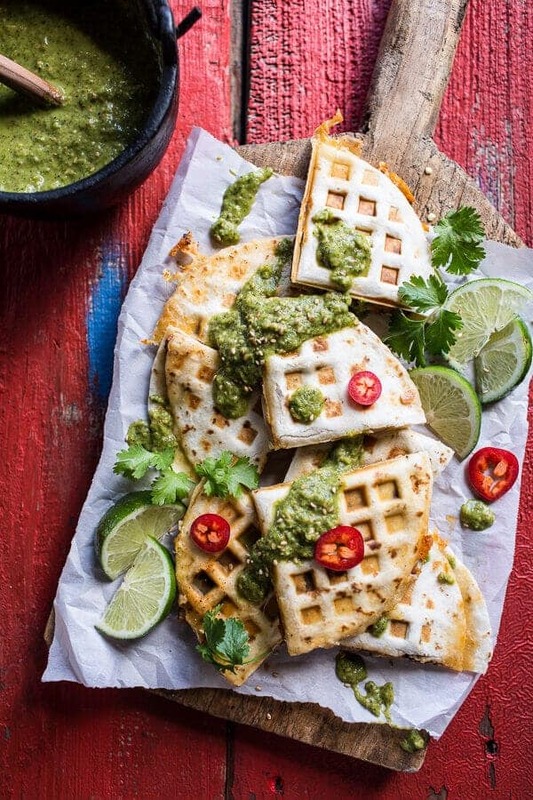 I love that you waffled these quesadillas, these look like the best ever! I LOVE al pastor! Yet somehow I have yet to make it at home. These look particularly fun. Help! 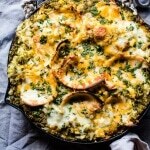 Making this now, and the ingredient list for the salsa verde is missing the rice vinegar. How much do I use? Just1 tablespoon, but I am guessing I am too late. I am sure it still turned out great. let me know and sorry for the lateness! 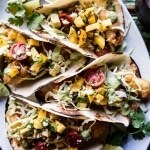 Saw your quesadilla recipe in a Good Housekeeping round up! You’re killing me with these photos. Seriously mouth watering. I love al pastor and how good does it sound thrown into a quesadilla with some salsa verde smothered all over it. Check, please. Awe! Thanks Melissa! Hope you are having a great week! How much rice vinegar are you supposed to use? It’s not listed in the ingredients but it’s mentioned in the instructions. Hey Taylor! So sorry about that. You need 2 tablespoons. Let me know if you have other questions, recipe is fixed! Hope you love this!